In stock -This product will ship today if ordered within the next 15 hours and 6 minutes. Vitamin C is an essential, water-soluble vitamin that cannot be manufactured by or stored in your body, so needs to be replaced on a daily basis. Your daily requirement for it is higher than any other water-soluble nutrient because, unlike most other animals, you cannot manufacture it in your body. Vitamin C is very unstable, so storing, peeling, freezing and cooking food can deplete the vitamin C content in it. In nature, vitamin C occurs in a food complex, including many bioflavonoids that assist its absorption in the body: these are also present in the Food State form. Food State Vitamin C has the same pH as in food, so is less acidic than ascorbic acid and therefore far gentler on the stomach. Most vitamin C sold on the market today is the isolated molecule of ascorbic acid, which is highly acidic and does not contain other food factors. Vitamin C complexed in citrus pulp, vegetable stearic acid, tablet coating (hydroxypropylmethylcellulose). Take 1-2 tablets daily as a food supplement or as directed by a practitioner. 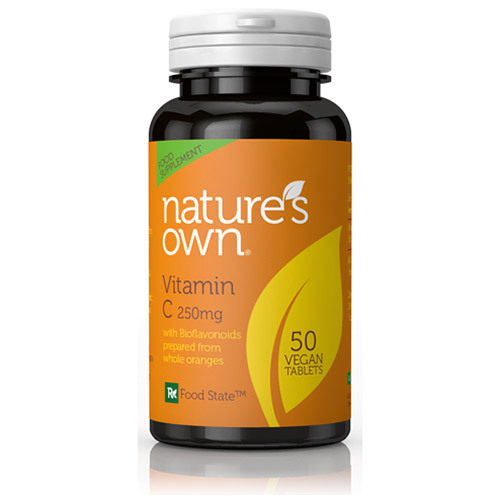 Below are reviews of Natures Own Food State Vitamin C - 50 Tablets by bodykind customers. If you have tried this product we'd love to hear what you think so please leave a review. 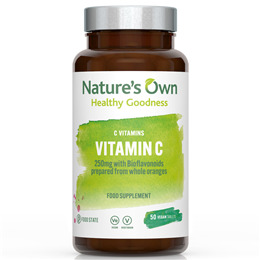 Vitamin C is an essential, water-soluble vitamin that cannot be manufactured by or stored in your body, so needs to be replaced on a daily basis. Your daily requirement for it is higher than any other water-soluble nutrient.